Today near Meadow Lake there’s a convergence of dragons . . . similar to but maybe bigger than the one I documented here five years ago. 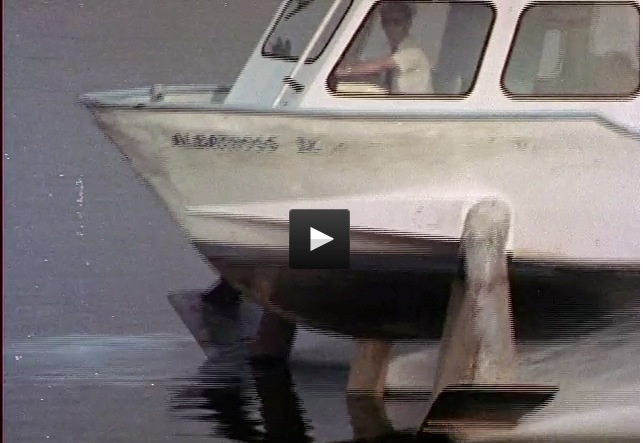 what this “driver” did after hulls receded back into the water for good. Thirteen boats–maybe unfortunately named–operated in the sixth boro! Where did they dock? Who maintained them? Here’s an intriguing eBay foto, which I’ll not bid on. 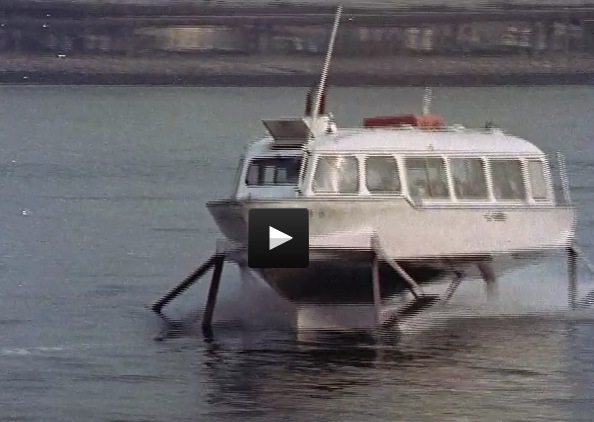 Boeing seems to have built a number of hydrofoils–as the Boeing 929. Of those still operating, most are in Eastern Asia, including these “Seven Islands” boats that once–about a decade ago–tried to establish a run between Florida and the Bahamas. Seven Islands features an up-to-date crew blog–only in Japanese–that has interesting fotos. Here and here is info on a hydrofoil operating on the black Sea out of Bulgaria. Here’s where I’ll leave this until I find out more. Meanwhile, if I get all my work done today, I may go see the dragons tomorrow. I remember the injection molded dinosaurs at the Sinclair exhibit, and those gas stations from the future they’re still on the GCP (grand central parkway) however, no longer Sinclair. It Seems like it was only yesterday, what happened! Great and interesting topic Will! Hi. This is my first time commenting on a blog so hope I’m doing it right. 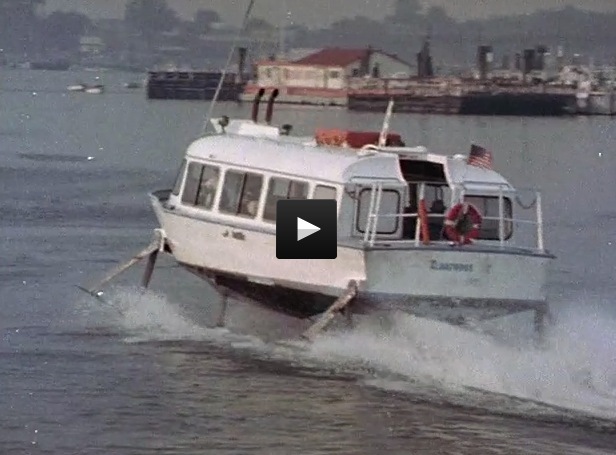 As to the hydrofoil post I went to work for American hydrofoils right out of the CG june /63 and was their first employee in NYC. Ran the first boat, the Albatross, 16 hours a day on test runs and demo runs. I believe I had the first original lic. with a hydrofoil endorsement to carry passengers. Ended up with about 2500 underway hours over three years until they went bust. I remember the guy at the wheel in the middle photo but not his name. As I recall number 9 was a real work horse. flew like an angel. Not all did! ended up making my career in the 6th boro but thats another story. Would love to find one of our hydrofoils to buy and fly again! They were great but all the reasons are for the next post if any one is interested. Lost all my hydrofoil pics in the divorce sorry to say. Oh, Ira Dowd was the owner and Bill Melon was operations. He was a retired PD Marine unit driver. Adding to my previous post I wanted to say that we assembled each hydrofoil at Mobrays yard behind the Statue of Liberty and we had a modified railroad car float at Kosnacs floating derrick at the foot of wall street at pier 11. we also ran out of the seaplane float at the 23rd st yacht club. We maintained them ourselves for the most part. glen– thanks much for the comments. i have some pics –although they are almost too small to use satisfactorily–and could run another post about these exotic vessels that worked in the sixth boro for only a short time. i’d love to see more pics and hear more stories. again, thanks. Are you still looking for pics and info regarding the hydrofoils running around “The Sixth Boro” I have about a ten year history as a Pilot for those boats from the East river to the Port Washington commuter boat to Lake Champlain and finally to Miami, Fla. Don’t know how much help I can be. Please let me know if you’re still interested. yessir, i am. i still have some photos i have not used . . . have been waiting for a bit more info. thx.